I'm glad that Jimmy Carter has written about his trip to North Korea, the fact that Kim Jung-Il left while he was there gave the rest of the leadership a chance to talk more freely. Hopefully, someone within our State Department will take advantage of the offer, without screwing things up too badly. In the US, the debate is between the hawks and the doves "The United States Central Command has proposed supplying Yemen with $1.2 billion in military equipment and training over the next six years, a significant escalation on a front in the campaign against terrorism, which has largely been hidden from public view. The aid would include automatic weapons, coastal patrol boats, transport planes and helicopters, as well as tools and spare parts. Training could expand to allow American logistical advisers to accompany Yemeni troops in some noncombat roles. Opponents, though, fear American weapons could be used against political enemies of President Ali Abdullah Saleh and provoke a backlash that could further destabilize the volatile, impoverished country." But more insidious, is how the US is seeking to block a lawsuit brought against it for having an American citizen on an assassination list. 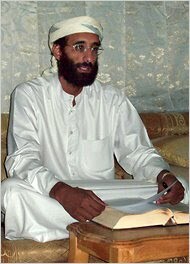 Bad enough that our mercenaries are combing the desert sands looking for New Mexican born Anwar al-Awlaki, who is accused of having ties to al-Qaeda even though there has been no proof made public. The US Justice Department would like to see the case dismissed before it goes to court. : "The lawsuit was filed by Mr. Awlaki’s father, Nasser al-Awlaki, who is represented by the American Civil Liberties Union and the Center for Constitutional Rights. It contends that designating a United States citizen for killing outside of a war zone, without an imminent threat, amounts to an extrajudicial execution, and it disputes the notion that battlefield law applies far from Afghanistan." What the newspapers are not saying, is that the government doesn't want a judge to rule that a president cannot put someone on a hit list for some perverse reason, based on suspicions and not facts. This could lead to bringing George Bush to trial for treason for invading Iraq without any solid facts to back his case, and the resulting killing of that country's leader, even if he was a bad man... Instead of letting the case go to court, the government will contend that: "... the lawsuit should be dismissed without discussing its merits. For example, officials say, the brief is virtually certain to argue that Mr. Awlaki’s father has no legal standing to file a lawsuit on behalf of his son." This argument should be thrown out as having no merit. "To strengthen the case, they are considering at least two other potential arguments, each with a downside.The first would involve asking the judge to dismiss the case because it could reveal classified information. Under the “state secrets doctrine,” the government can seek to withhold evidence or block lawsuits related to national security. The government’s increasing use of the state secrets doctrine to shield its actions from judicial review has been contentious. Some officials have argued that invoking it in the Awlaki matter, about which so much is already public, would risk a backlash. David Rivkin, a lawyer in the White House of President George H. W. Bush, echoed that concern. “I’m a huge fan of executive power, but if someone came up to you and said the government wants to target you and you can’t even talk about it in court to try to stop it, that’s too harsh even for me,” he said." The other argument is they want: "... a declaration that in war who can be targeted — and where — is a “political question” for the executive branch to decide, not judges. From the judicial department's viewpoint, all this would become moot if we killed off Mr al-Awlaki, leaving only his family to grieve or care for him. I just don't like to see Obama support or condone those policies that make us more of a police state. They seem to originate and continue despite whomever is in the White House, giving rise to a paranoid theory of a ruling cabal that really controls government, controls the economy, and is the reason why the most recent census shows that 1 in 7 Americans are living in poverty. Yeah, let's extend those Bush tax cuts because they are sooo beneficial... Besides, now that we have committed to eventually leaving Afghanistan, our military has to have someplace that's not in Africa to send our troops and justify its bloated budget... Heaven forbid that we should save $500 billion per year and let that money help pay off our defecit.